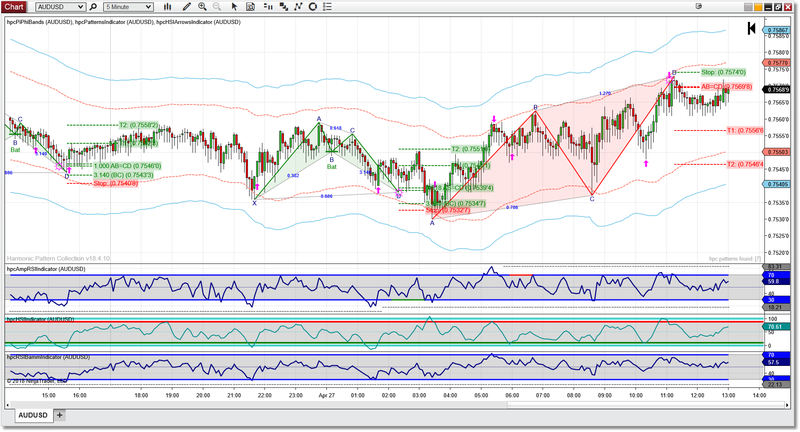 Our Harmonic Pattern Collection indicators are fully integrated with the NinjaTrader Market Analyzer. You can load multiple tabs in the MA, which each tab set to a different list of symbols, or a different bar interval, or both. And each tab can be linked to its own chart. The full suite of indicators in the NinjaTrader version include the pattern scanner, HSI and HSI Arrows, RSI Bamm, Amplified RSI, Volume Spike, and Pi Phi Bands. The cosmetic properties of all of the indicators are fully customizable and the peformance is lightning-fast. If you are looking for our HPC for eSignal product, please click here. If you are looking for our HPC for Sierra Chart product, please click here. If you are looking for our HPC for MetaTrader 4 product, please click here. 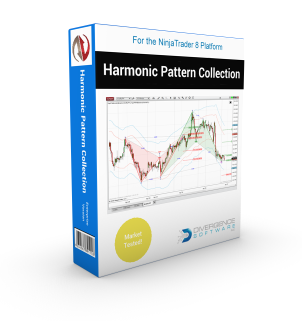 The Harmonic Pattern Collection for NinjaTrader 7 and 8 is now available! NinjaTrader is one of the most popular and widely-used charting/trading platforms on the market, with features and flexibility second to none. The NinjaTrader version of HPC has all of the features and functionality that you have come to expect, including tight integration with the Market Analyzer and MA/Chart linking. 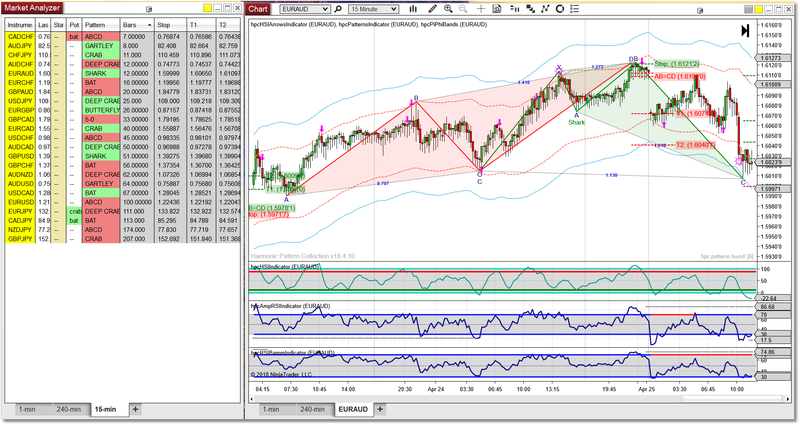 And it works with all securities and all bar intervals available in NinjaTrader. Link to the HPC for NinjaTrader 8 Compiled Assembly. Current version is v19.02.15. Please note that the current HPC version requires NinjaTrader 8.0.17.2 or newer in order to operate, so make sure you update your NinjaTrader platform before you install the new HPC version. Follow the instructions in the Installer section of the User Guide to install the software and generate your HPC License String. We do offer a free trial so please take advantage of this free trial BEFORE you purchase a subscription. To request your free trial, just send an email to support@sr-analyst.com with Ninja Trial in the subject field, and include your full name and your HPC License String. It is also one of the few harmonic pattern tools fully endorsed by Scott Carney, the president and founder of HarmonicTrader.com. Scott owns all of the trademarks associated with the harmonic patterns and is the hands-down expert in teaching others how to trade the patterns. If you sign up for one of our Pro or Patterns Only packages (described below) you will receive a free Gold membership for Scott's Harmonic Trader program where you will learn how to trade the patterns from the expert. All Pro tier licenses receive a 30-day complimentary Harmonic Trader Gold Membership (as long as you remain a Pro tier subscriber), which includes live harmonic trading sessions with Scott Carney, access to recordings of past trading sessions, access to the Harmonic Trading Video Library, the Harmonic Trader Monthly Report, and PDF downloads of "The Harmonic Trader". All Patterns Only tier licenses receive a 30-day complimentary Harmonic Trader Gold Membership (as long as you remain a Patterns Only tier subscriber), which includes live harmonic trading sessions with Scott Carney, access to recordings of past trading sessions, access to the Harmonic Trading Video Library, the Harmonic Trader Monthly Report, and PDF downloads of "The Harmonic Trader". Upgrade your lease to outright purchase of the Harmonic Pattern Collection and you will receive a total of 3 months FREE HT Gold Membership, which is a $450 VALUE and includes live harmonic trading sessions with Scott Carney, access to recordings of past trading sessions, access to the Harmonic Trading Video Library, the Harmonic Trader Monthly Report, and PDF downloads of "The Harmonic Trader". All HPC owners are entitled to TWO LICENSES PER PURCHASE! All who purchase will receive a copy of Scott's "Harmonic Trader Volume Three" mailed directly to them, which is a $80 VALUE. Use Discount Code HPC20 at checkout for an additional 20% discount! So go ahead and browse through the User Guide and contact us when you are ready to take your free trial. We currently support both the 32-bit and 64-bit versions of NinjaTrader 7 and NinjaTrader 8. The compiled assemblies for both NinjaTrader 7 and NinjaTrader 8 are available from the Installer section on the right-side of this page. Note that the User Guide and all screen shots and examples are based on the version for NinjaTrader 8. Free 7-Day Trial is Available! Note: The 1-month, 6-month, and 12-month licenses are auto-renewal subscriptions, while the Lifetime license is a one-time fee. For Tier #1 (Pro) and Tier #2 (Patterns Only) we also offer the 6-month and 12-month licenses as a one-time purchase. If you purchase a recurring subscription, it can be managed via our Subscription Portal. Please be sure to take advantage of the free trial BEFORE you purchase a subscription. That way you can be sure that the HPC software is compatible with your current setup. Note: The NinjaTrader installer is in the form of a Compiled Assembly. Refer to the User Guide for instructions on how to import the HPC indicators into your copy of NinjaTrader 8 or 7. If you are updating from a prior version ALWAYS remove the existing Compiled Assembly first! Note: Be sure to click on the link above to sign up for the Harmonic Trader Basic Membership, which will give you access to a number of additional educational materials to get you started. © Divergence Software, Inc. All rights reserved.